Ge nanocrystals (Ge-NCs) embedded in SiN dielectrics with HfO2/SiO2 stack tunnel dielectrics were synthesized by utilizing low-energy (≤5 keV) ion implantation method followed by conventional thermal annealing at 800°C, the key variable being Ge+ ion implantation energy. Two different energies (3 and 5 keV) have been chosen for the evolution of Ge-NCs, which have been found to possess significant changes in structural and chemical properties of the Ge+-implanted dielectric films, and well reflected in the charge storage properties of the Al/SiN/Ge-NC + SiN/HfO2/SiO2/Si metal-insulator-semiconductor (MIS) memory structures. No Ge-NC was detected with a lower implantation energy of 3 keV at a dose of 1.5 × 1016 cm-2, whereas a well-defined 2D-array of nearly spherical and well-separated Ge-NCs within the SiN matrix was observed for the higher-energy-implanted (5 keV) sample for the same implanted dose. 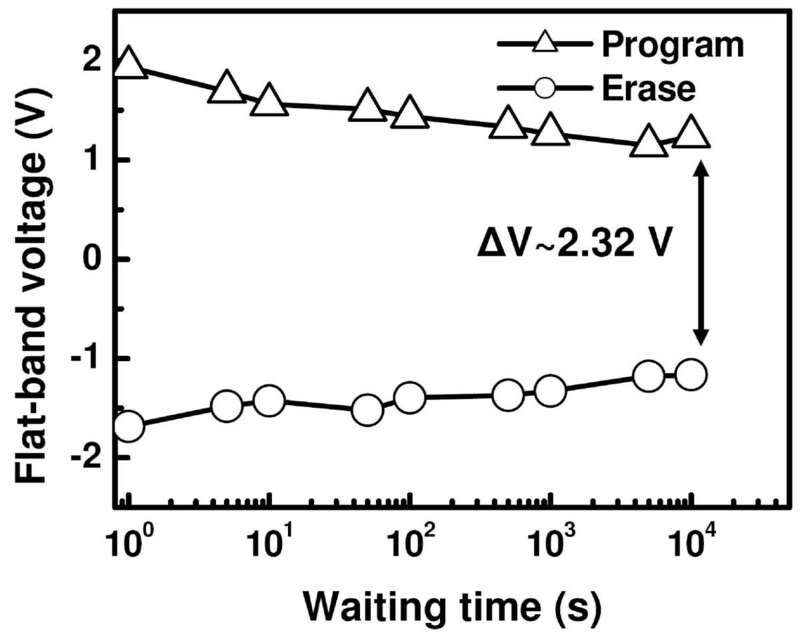 The MIS memory structures implanted with 5 keV exhibits better charge storage and retention characteristics compared to the low-energy-implanted sample, indicating that the charge storage is predominantly in Ge-NCs in the memory capacitor. A significant memory window of 3.95 V has been observed under the low operating voltage of ± 6 V with good retention properties, indicating the feasibility of these stack structures for low operating voltage, non-volatile memory devices. During the last decade, non-volatile memory (NVM) structures consisting of semiconductor nanocrystals (NCs), in particular, Si and Ge-NCs, embedded in a dielectric matrix have drawn considerable attraction because of their high endurance, low operating voltage, reduced lateral discharge path, low power consumption, larger retention, and faster operation [1–5]. Compared to Si-NC, utilization of Ge-NC as the floating gate material can give rise to enhanced device performance because of its smaller band gap, which provides both a higher confinement barrier for retention mode and a lower barrier for program/erase mode [4, 5]. Quantum confinement effects should also be higher in Ge than in Si because of its smaller electron and hole effective masses, higher dielectric constant, and larger excitonic Bohr radius [6, 7]. In recent studies, high-k gate dielectrics replaced the conventional SiO2 dielectric to be used as tunnel and control oxides in NVMs, which allows for a thinner equivalent oxide thickness without sacrificing the non-volatility [8–12]. Furthermore, the thicker physical thickness of the high-k dielectrics ensures good retention characteristics, while due to unique band asymmetry with Si, their lower electron barrier height allows for a larger tunneling current at low control gate voltage when the device operates in the programming regime [10, 12]. However, the trade-off between program/erase efficiency and data retention remains an important issue. One of the promising ways to improve the trade-off is to use an asymmetric tunnel barrier, which typically consists of double-stack insulating layers having different band-gap energies [13–15]. In previous studies, Wang and Lu  have implemented stacked HfO2/SiO2 tunnel layers and successfully fabricated uniform Ge-NCS with improved charge storage effect using electron-beam evaporation method. However, they have employed relatively thicker dielectric films for the evolution of Ge-NCs. In the present investigation, low-energy ion implantation method, which is fully compatible with the mainstream CMOS technology, has been employed for the formation of Ge-NCs in SiN matrix with thinner HfO2/SiO2 stack tunnel layers. In addition, taking advantage of the excellent diffusion barrier properties of Si3N4 , well-defined Ge-NCs are expected to be formed in the top nitride layer without any significant diffusion of Ge toward Si/tunnel oxide interface and/or to the surface of control layer by suitably varying the implantation parameters and annealing condition. The dependence of implantation energy for the formation and evolution of Ge-NCs in these stack structures were studied further. 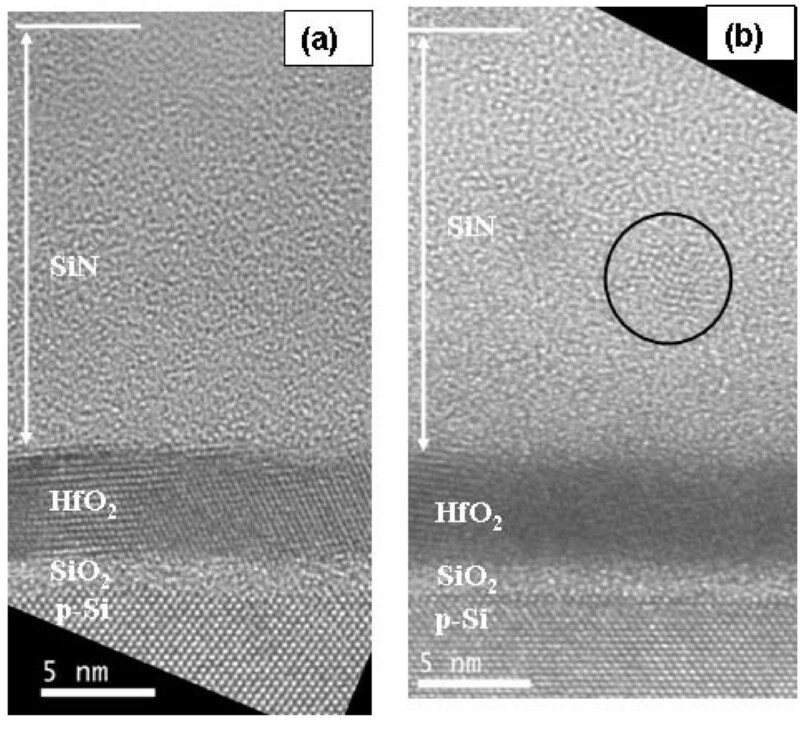 Before ion implantation, 1.2 nm of SiO2 was thermally grown on p-type Si (100) substrates (resistivity 1-10 Ω cm). Subsequently, 4.7 nm of HfO2 were deposited by metal organic chemical vapor deposition technique. The top SiN layer with a thickness of about 12 nm was then deposited with electron cyclotron resonance plasma-enhanced chemical vapor deposition method under a flow of SiH4 and N2 (instead of NH3) to minimize the H content in the films. Ion implantation in these stack layers were carried out with 74Ge+ ions using GeH4 gas source for the extraction of Ge. The Ge+ ion implantation was carried out at two different energies of 3 and 5 keV, while the dose was kept constant at 1.5 × 1016 cm-2. These two sets of samples implanted at 3 and 5 keV are denoted as A3 and A5, respectively. The post-implanted samples were subjected to conventional furnace annealing at 800°C in highly pure dry N2 for 30 min for the evolution of Ge-NCs. For reference, some SiN/HfO2/SiO2 stack layers were treated under the same annealing condition without any Ge+ implantation and were defined as the control sample. The formation and evolution of Ge-NCs have been investigated using high-resolution electron microscopy (HREM) on cross-sectional specimens. Cross sectional samples were prepared by mechanical polishing and ion milling using the standard procedure. HREM images were taken using a field emission TEM (FEI Tecnai™ F20 operating at 200 kV) equipped with a spherical aberration corrector. Metal-insulator-semiconductor (MIS) memory capacitor structures were fabricated from the samples by evaporating Al electrodes with 0.8-mm diameter with a shadow mask and Al rear-side contact after scratching the back surface. Capacitance-voltage (C-V) and conductance-voltage (G-V) measurements were carried out using HP4192A impdance analyzer through a LABVIEW interface. Cross-sectional HREM images of the post-implanted annealed samples A3 and A5 are shown in Figure 1a,b, respectively. As evident from Figure 1a, no Ge-NC was observed for sample A3. The SiN layer underwent a swelling of about 4 nm, whereas the thickness of the underlying HfO2 and SiO2 layers remain almost the same as in the as-deposited sample. In contrast, HREM image of sample A5 (Figure 2b) shows the existence of a Ge-NC with clear lattice fringes with a separation of 0.327 nm, which matches well with the Ge (111) inter planar distance in the diamond structure. Nearly spherical-shaped Ge-NCs with an average size of about 3.5 nm were clearly observed in the SiN matrix at a distance of about 5.6 nm from SiN/HfO2 interface. The total SiN thickness (with embedded Ge-NCs) is 15.7 nm, indicating significant swelling of this layer (3.7 nm) as a result of ion implantation and annealing. There is no significant increase of the HfO2 thickness while the interfacial SiO2 (IL) layer increases from 1.2 to 1.9 nm as a result of implantation and annealing. This swelling could be attributed to the Si substrate oxidation. This phenomenon has already been observed for ion-implanted thin layers and has been attributed to penetration of H2O from the ambient through the highly damaged layers . It is noteworthy that the total SiN thickness of both samples after post-implantation thermal annealing is comparable, indicating the weak dependence of swelling effect on implantation energy . As discussed before, for low implantation energies, swelling effect is predominantly dependent on implantation dose rather than implantation energy [19, 20]. where ΔV fb is the measured flat-band shift, C ox is the total oxide capacitance, q is the electronic charge, and A is the top contact area. The trap charge density was estimated to be 5.7 × 1012 cm-2 (sample A5) and 0.78 × 1012 cm-2 (sample A3) at a sweeping voltage of ± 7 V, indicating that the significant charge storage in sample A5 is predominantly due to Ge-NCs. It is interesting to note that the C-V curve of sample A3 shows a significant positive shift compared to the control sample, indicating the existence of fixed negative charges in the dielectrics. It is speculated that sample A3 contains a significant amount of GeO x -type network. These dangling bond structures can then capture electrons and become negatively charged, thereby causing a positive shift of the C-V curves of sample A3. Similar observations have been reported for Ge-NCs embedded in a SiO2 matrix . For a better understanding of the results, frequency-dependent C-V and G-V measurements were further carried out in the frequency range of 10-500 kHz. This is to ascertain that most of the charging effect originated mainly from Ge-NCs and/or Ge-NCs-related traps with minimal influence from interface traps, which typically lead to frequency dispersion in C-V and G-V characteristics. For this purpose, G-V measurement is considered to be a more sensitive approach than C-V measurement technique and provides the dynamic information related to trap density [25–27]. In fact, conductance is directly related to the energy loss in response to the applied AC signal during the capture and emission of charge carriers by interface states. Frequency-dependent C-V and G/w-V curves for sample A3 and A5 are shown in Figure 3a,b, respectively. In both cases, no distortion in C-V characteristics due to slow traps and/or large surface density (flat step) was observed in the samples under study with a change in frequency. It was noticed that the full-width-at-half-maximum (FWHM) of the conductance peak is small and almost constant in the frequency range of 10-500 kHz, indicating that the hysteresis and conductance peak are of the same origin . It is a well-known fact that a conductance peak with large FWHM values can be attributed to the presence of a considerable amount of interface states. It is interesting to note that both C-V and G/w-V curves of sample A3 shift toward more positive bias with decreasing frequency, and the shift is more prominent in the low-frequency region (<50 kHz). The shift is marked by minimal frequency dispersion in accumulation (less than 2%), capacitance indicating minimal influence of series resistance, and dielectric constant variation with altering the measurement frequency. From Figure 4, it is noteworthy that the same amount of hysteresis and stored charge were obtained in sample A3 irrespective of the measurement frequency. Hence, the capacitance shift can be attributed to the presence of fast traps and/or border traps (near-interfacial traps), which can have a rapid communication with the underlying Si-substrate . The G/w-V curves shift in accordance with the C-V curves. It was observed that G/w-V curves of sample A3 exhibit broader and larger peaks near flat-band voltage than those of sample A5, indicating higher energy loss during charge exchange. Frequency dependent C-V hysteresis windows. 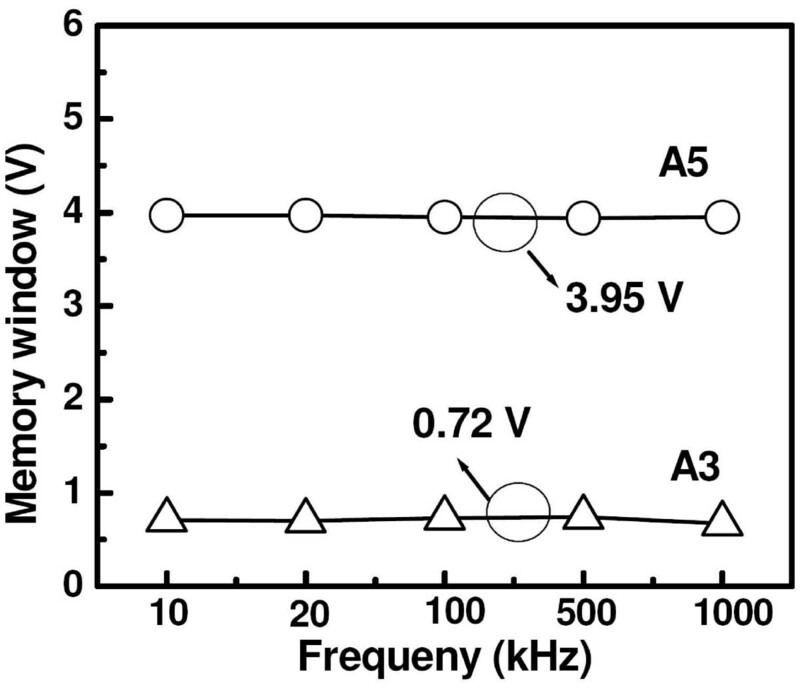 The C - V hysteresis windows measured at various frequencies ranging from 10 kHz to 1 MHz for the two samples at a sweep voltage of ± 6 V. The observed memory windows maintain the same value of 3.95 and 0.72 V for the applied frequencies in samples A5 and A3, respectively. In the investigation of this study, an implantation energy of 5 keV seems to be the optimum parameter for a particular dose of 1.5 × 1016 cm-2 and SiN/HfO2/SiO2 stack for the evolution of Ge-NCs and obtaining significant memory properties. In this regard, sample A5 has been chosen for charge retention measurement to have a better insight for its utility in low power-consuming NVM devices. Figure 5 shows the charge retention characteristics of sample A5 by stressing the samples with voltage pulses of ± 6 V (positive for electron charging and negative for hole charging) for 3s. The retention curves exhibit a logarithmic dependence on the waiting time. A faster charge loss rate was observed after applying a positive stress, indicating higher electron loss rate due to the higher conductance band edge of Ge-NCs . A significant memory window of 2.36 V has been achieved through a waiting time of 104 s with a possible trend of stabilization indicating charge confinement in Ge-NCs. With further extrapolation of the retention curves, a memory window of 1.06 V has been estimated after a waiting time of 10 years. This enhanced charge retention should be attributed to charge confinement in Ge-NCs, immunity of Ge-NCs to local defects in the dielectric, and interface traps. Evolution of flat-band voltage as a function of waiting time for the MIS structures after Ge + ion implantation at 5 keV followed by thermal annealing at 800°C and subjected to a stress voltages of +6 V for electron charging, and -6 V for hole charging for 3s. The constant-capacitance method at flat-band point was used for this measurement. In summary, we have conducted a comparative investigation of Ge+ ion implantation energy-dependent memory effects in SiN dielectric layers with HfO2/SiO2 asymmetric tunnel barriers at a constant implantation dose of 1.5 × 1016 cm-2, and subsequent thermal annealing at 800°C in N2. For the lower Ge+ implantation energy of 3 keV, no Ge-NC was observed in the stack structures, and the resultant MIS structure exhibited a small memory window of 0.74 V, which is attributed to a net negative charge storage in GeO x -dangling bonds. In contrast, for the higher Ge+ implantation energy of 5 keV, nearly spherical and well-isolated Ge-NCs with an average size of 3.5 nm were self-assembled within the top Si3N4 layer at a distance of 5.6 nm from SiN/HfO2 interface. A significant memory window of 3.95 V has been achieved over a small voltage sweep range (≤6 V). 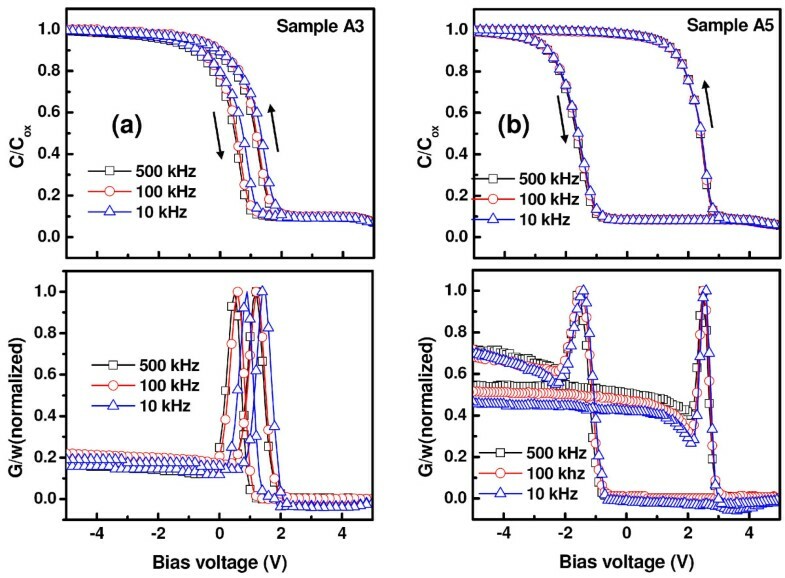 Frequency-dependent C-V and G-V curves indicate negligible contribution from interfacial defects toward the charge storage capability. An extrapolated memory window of about 1.06 V is achievable for a waiting time of 10 years due to the charge confinement in Ge-NCs, indicating the utility of these Al/SiN/Ge-NC + SiN/HfO2/SiO2/Si stack structures for low operating voltage NVM devices. BSS, AS, MC, and CB designed the study. SL provides the HfO2/SiO2 layer. Then BSS developed the SiN/HfO2/SiO2 stack layers. DM helped in ion implantation in these stack structures. FG, MC, JG, and CB prepared the samples for TEM observation and investigated the TEM results and done all the TEM analysis. BSS investigated and performed post-fabrication treatment, carried out all the electrical characterization studies, analyzed the results, and prepared the draft of the manuscript. Moreover, AS and CB participated in the coordination of study. All authors read and approved the final manuscript.